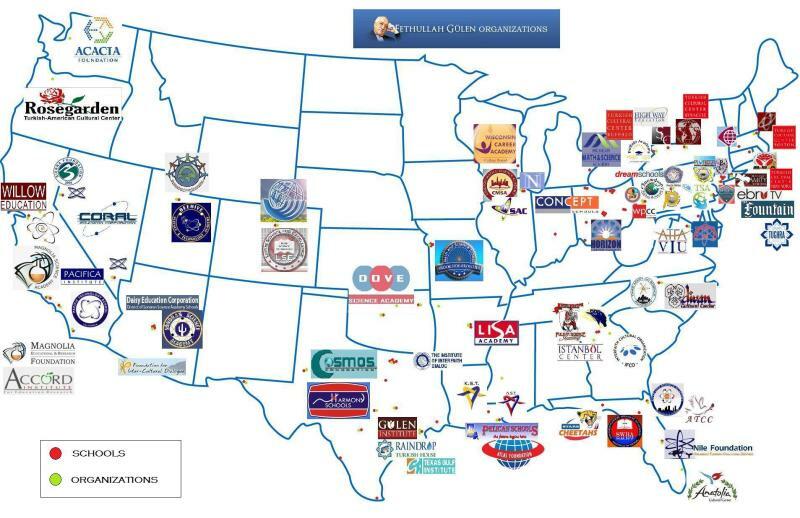 The Map of Gulen - CHARTER SCHOOL WATCHDOG http://www.charterschoolwatchdog. Now this must really keep the guys busy. They probably had to hire a full-time graphic designer to keep up with all of their pretty logo designs. And check out some of the names of the schools- -like Rose Garden, Harmony, Horizon, Willow, Fountain, Cosmos... it is so poetic and dream-like -- isn't it? Perhaps Gulen is a poet at heart -- struggling to shed his criminal cloak to follow in the footsteps of Whitman, Dickinson, Bronte, or Poe. This map was taken from a Turkish newspaper, and has the benevolent picture of their fearless leader Gulen, as a kind "father-figure" at the top of the map. He just sits there smiling down at his little puppets, laughing all the way to the bank(s) with our American tax dollars. Lotus School for Excellence Aurora, CO.
Science Academy of Chicago Grade 1-Grade 8 8350 N.
Operated by Concept Schools, Inc.
Schools operated under the Cosmos Foundation, TX. Dove Science Academy-Tulsa 280 S Memorial Dr.